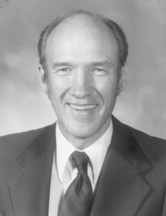 SIMPSON, Alan Kooi, (son of Milward Lee Simpson), a Senator from Wyoming; born in Denver, Denver County, Colo., September 2, 1931; attended Cody, Wyo. public schools; graduated, University of Wyoming, Laramie, Wyo., 1954; graduated, University of Wyoming Law School 1958; admitted to the Wyoming bar in 1958 and commenced practice in Cody; served in the United States Army, Infantry 1954-1956; assistant attorney general of Wyoming 1958-1959; city attorney, Cody, Wyo. ; United States Commissioner 1959-1969; member, Wyoming house of representatives 1964-1977; elected as a Republican to the United States Senate, November 7, 1978, for the six-year term commencing January 3, 1979; subsequently appointed by the Governor, January 1, 1979, to fill the vacancy caused by the resignation of Clifford P. Hansen for the term ending January 3, 1979; reelected in 1984 and 1990 and served from January 1, 1979, to January 3, 1997; was not a candidate for reelection in 1996; Republican whip (1985-1995); chairman, Committee on Veterans Affairs (One Hundred Fourth Congress); visiting lecturer, Kennedy School of Government, Shorenstein Center, and Director of the Institute of Politics 1997-2000; commissioner, American Battle Monuments Commission 2001-; co-chairman, Continuity in Government Commission 2002-. Simpson, Alan K. Right in the Old Gazoo: A Lifetime of Scrapping with the Press. New York: William Morrow, 1997.